Mmmmm...blueberry cheesecake. 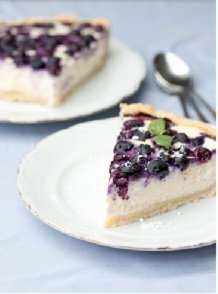 I love all flavors of cheesecake, but if I had to live on just one variety it would have to be blueberry. Some of you may have only one idea of what blueberry cheesecake looks like, but I'm sure you will be just as surprised as I was to learn that there many delicious combinations to choose from. The first recorded mention of cheesecake was in 776 B.C. It was served to the athletes during the first Olympic Games. The Romans then brought the recipe from Greece to all of Europe. Hundreds of years later, cheesecake appeared in America, with many thanks to the immigrants. In 1872, cream cheese was invented by American dairymen, who were trying to recreate the French cheese, Neufchâtel. Philadelphia cream cheese is the most popular cheese used for making cheesecake today. The recipes I have collected include everything from "easy no bake" to "more complicated but worth it" varieties. Each recipe I have listed is an original. There are no duplications in my collection.